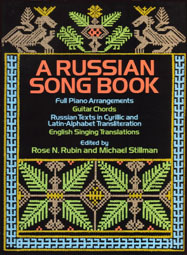 Sheet Music for 44 songs including lyrics, vocal line, piano arrangement, and guitar chords . . .This book includes 25 folk songs and 19 popular songs including "Song of the Volga Boatmen", "Moscow Nights" and "Wait For Your Soldier". Lyrics for each are shown in the original Cyrillic, in transliteration to approximate the sound of the Russian lyrics, and in an English singing translation.